Songbird Creations: Waiting for Review and an Easter treat. It was Easter, so therefore in the UK, we had Friday and Monday as national holidays. So we used this time to launch ROO on the OUYA and to prepare for the iOS release. 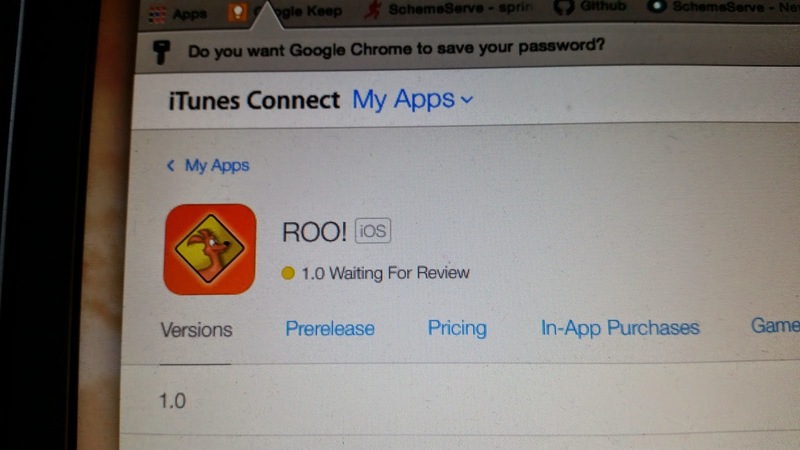 ROO is currently (as of the 9th of April) waiting for Review. This apparently could take a little time so we all have to be patient. It will be really nice though when it's released as we've done a load of work to make it look nice on the iPad and iPhone with that lovely Retina screen. Of all the stores we've released on, the App store is probably the most difficult to get going with. There are many aspects of the store which take some research in order to get right. Luckily for us, Dean knew what he was doing and was able to steer our wayward ship through any potential rocks to get us out to sea. It's also the 3rd time I've had to fill out a Tax form. As Songbird Creations is a Limited UK company, we don't pay US taxes (instead we pay UK taxes) but Uncle Sam needs to be reassured that we're not trying to get away with his money, so we fill in a W-8BEN form and sign it. For the OUYA I had to print it, physically sign it, scan it and send it back to them. Amazon had a version online and a handy helper, which while was handy could have used a "We're a UK company, just fill it in for me" button like Google does. While Preparation was certainly important, I've never had to confirm as many things in my life as I did getting the more legal aspects of the store running. Phew, glad that part is over is all I can say. Phones typically have a slimline aspect ratio some are 1080p others a variation of, however for a landscape game, you're typically looking at most of the action being towards the bottom of the screen, certainly for ROO this was the case. Pretty clouds, blue skies and mountains cover the top to middle and give the illusion of distance and speed while the foreground and character reside towards the bottom to ground the action. For the OUYA, we needed to move things up a little otherwise the player is bombarded with a TV image made entirely of sky, for iPad it was worse as the aspect ratio is different again. So we had to work out how much space was required to keep ROO in pretty much the optimal place while filling the rest of the screen with interesting but not too distracting detail. We had to make some more graphics to place at the bottom of the level. Once we we done however, it looked and played really nicely. We also had to add an Achievement Toast system to complement the Game Center achievements which you can see in this video. On Friday evening, I went out around Cambridge and introduced a few people to ROO, one of the bits of feedback was to do with the Perfect Landing / Resurrection system. It waited for 2 seconds after ROOs failure and used a perfect landing token to burst back into the game (basically a lives system) however it turned out that people were becoming frustrated with the way it was implemented. Often they would reappear only to hit a cactus, a rock or worse - fall directly into a ravine. So something had to be done because while funny, I don't want unhappy players. So now there's a system where you're prompted to tap the screen to reappear when you want to or wait the full 2 seconds. Play testing this feature made it obvious that it was the correct solution. It makes failure your own fault as opposed to the game punishing you randomly. It was really nice to see ROO on the OUYA store so I documented it with a little video. So you can see me install ROO for the first time on the OUYA as well as see how to get those pesky perfect landings. Stick around to the end for a little discussion in difficulty, game dev principles and a personal message from me. So there you have it. ROO is on the OUYA market as well as Google Play store and the Amazon App store and we're awaiting our entry to the App store.